Vancouver was born in Gastown. As old as Canada itself, the neighbourhood owes its start to Gassy Jack and the saloon he built on its shore. Today, Gastown is a refreshing mix of old and new, casual and cutting-edge, playing host to visitors and providing a buzzing backdrop for enterprising Vancouverites. 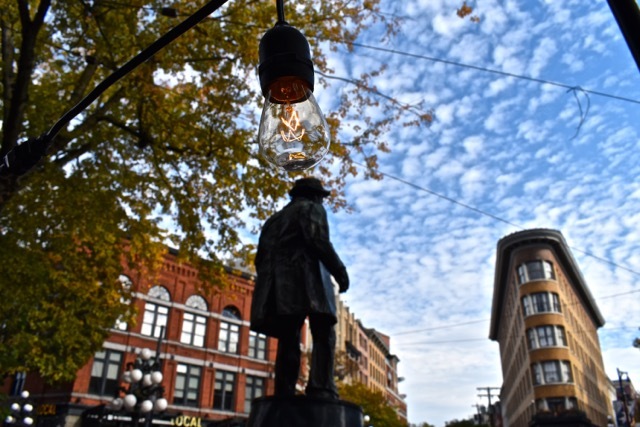 Designated a National Historic Site, Gastown is a diverse and exciting neighbourhood that pays tribute to its heritage with an independent spirit. Armed with only a barrel of whisky, and a penchant for long-winded tales, John ‘Gassy Jack’ Deighton wandered through the wilderness of the Coast Salish lands in 1867 and set up his saloon on the south shores of Burrard Inlet. Where the whisky went, others soon followed, with loggers and mill-workers naming the area Gastown to honour Jack for his generous pours. As Vancouver grew out of this rough-and tumble neighbourhood, Gastown transformed into the city’s commercial and shipping hub — its brick warehouses and stone structures still standing today. Now a thriving and diverse urban community, these character-rich spaces are home to some of the country’s most creative companies. The neighbourhood offers an internationally recognized mix of hip and heritage, with award-winning restaurants distinctive boutiques, speakeasy-style clubs and renowned art galleries. And, it continues to be home to a multifaceted group of residents, just like in the old days. Gastown is where Vancouver begins. 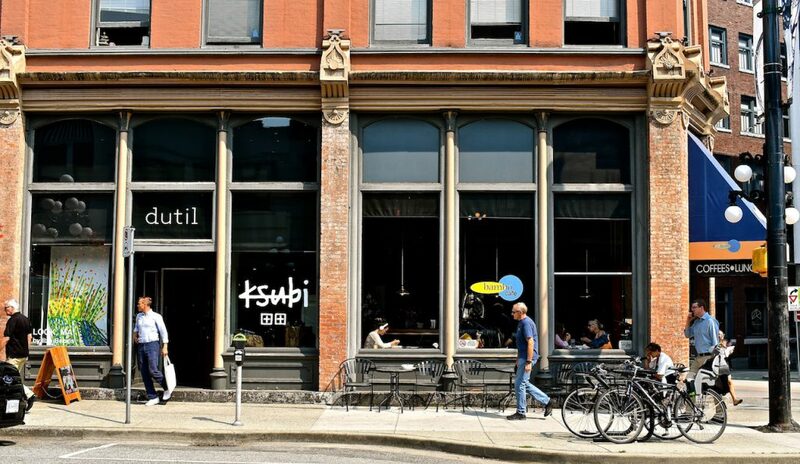 Gastown brings the best of the city together in a twelve-block area of concentrated style. 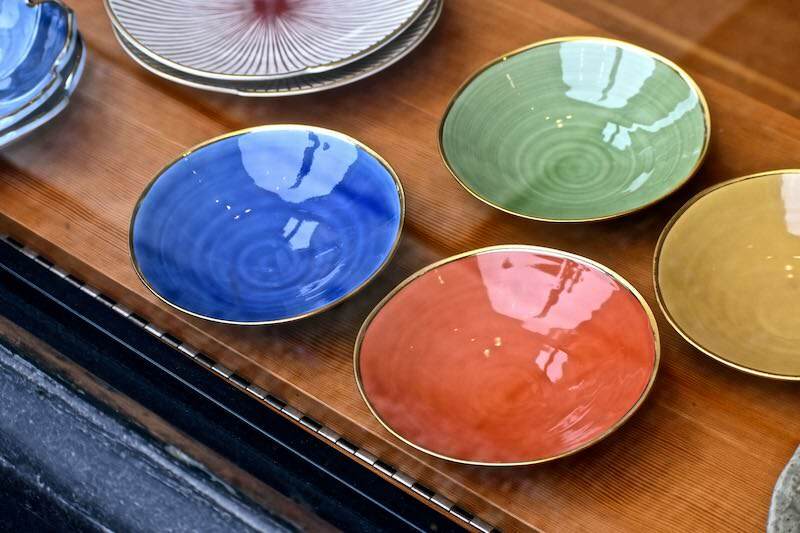 As Vancouver’s design district, full of small independent shops, you’ll find everything from modern home furnishings, decor accents and unique gifts to tried-and-true souvenir stops. A shopping experience like no other. When it’s time to sit down and savour the moment, restored brick and timber buildings play host to an eclectic mix of culinary fare. Gastown boasts some of the best eateries in the city — whether you’re in the mood for a light snack, hearty meal or great drinking spot, there’s a wide range of flavours to suit every taste. Inspiration flows within Gastown’s galleries, as classical and cutting-edge artists showcase their work. The neighbourhood is home to some of the country’s most renowned Inuit and native art as well as a new generation of critically acclaimed contemporary artisans. Immerse yourself in culture at the heart of the city. Independent boutiques sharing cobblestone streets bring exclusive labels and local designers to make up a distinct shopping destination. Frequently highlighted by the international fashion radar, Gastown is the place to find an unmatched selection of inspired designs for men and women. Keeping with the tradition of Gassy Jack’s bustling saloon, Gastown offers a vibrant and distinct after-dark scene. Live music filters onto the streets from a variety of cocktail bars, while international DJs mix sounds for local dancing crowds. With a wide range of entertainment, there’s something for everyone. You’ll likely find yourself spinning into the early hours of the morning. Long a commercial hub, Gastown is an awardwinning leader in urban preservation and renewal that has fostered a diverse community of creative businesses and residents. With designer lofts and live/work studios now occupying brick warehouses,Gastown is a 24-hour neighbourhood that offers a dynamic lifestyle unparalleled in the city. Named after Harry Braithwaite Abbott (1820–1915), first general superintendent of the Pacific Division, Canadian Pacific Railway (CPR). Named after Richard Henry Alexander (1844–1915), manager of Hastings Sawmill. Named after Henry John Cambie (1836–1908), first divisional engineer of the CPR. Named after Dr. Robert William Weir Carrall (1837–79), doctor and politician. Named after Don Antonio Bucareli y Cordova, 46th Viceroy of Mexico. Named after Joshua Attwood Reynolds Homer (1827–86), a New Westminster merchant and MP for New Westminster, 1881–86. Named after Dr. Israel Wood Powell (1836–1915), the first president of the Medical Council of British Columbia and first superintendent of Indian Affairs for British Columbia. Named after its location on the waterfront. At high tide the water from Burrard Inlet used to cover parts of Water Street. Named after Trounce Alley in Victoria by Frank W. Hart, whose undertaking establishment on Cordova Street backed onto the alley. Gastown has over 2000 covered parking spaces in its secure parkades along with many reserved spaces for carshare parking (Evo, Car2Go, Modo, Zipcar) You can also lock up your bike within certain parkades, and the neighborhood has a number of Mobi Bikeshare stations. Located just 2 blocks east of both the CruiseShip Terminal and the Trade & Convention Centre, Gastown is an easy 5 minute walk from both locations.